Norway Has Chauvinistic Tunnel Vision When It Comes to Congo. The Country Has Great Possibilities. This view derives from a chauvinistic tunnel vision. We will celebrate Mukwege best by acknowledging that this view is historically, geopolitically, and ethically unacceptable. The DRC has challenges. Nevertheless, it is superficial to brand it with labels such as “chaotic” and “ungovernable”, a “collapsed state” or “unstable”. These arise from the conflicts that have characterized the country, first in the 1960s and more recently in the 1990s. Of course, there are problems with governing a country that is almost the same size as Western Europe, but lacks Western Europe’s infrastructure. The Congolese state functions, albeit in a peculiar manner, and it suffers intermittent collapse. And even if “chaos” and “instability” are realities, much of the cause is interference by foreign actors, sometimes in alliance with local actors. Since independence in 1960, the DRC has been characterized by geopolitical rivalries, regional conflicts, and gross exploitation. In the 1960s, foreign mining interests supported attempts to secure the secession of Katanga and Kasai provinces. The election of Patrice Lumumba as prime minister in 1960 and his subsequent assassination embroiled the country in the Cold War conflict between East and West, leading to UN intervention. When the UN withdrew, the country’s military leader, Joseph Mobutu, took over, with American support. He held power for 32 years, established a kleptocracy, plundered the state into collapse, and bribed some of the population. No one defended him when he was deposed. At the same time, the violence started that in the years 1998–2003 may have killed millions and forced an equal number to flee. Mukwege put the war into a wider political context when he criticized the central government in Kinshasa for betraying the country’s people. Mukwege was among the first eyewitnesses to the massacres that started in eastern and northern DRC in the mid-1990s. His 20 years of effort are described in the book The Man Who Mends Women (originally published in French) by the Belgian journalist and author Colette Braeckman. The book describes a man who saw far beyond his calling as a doctor. He saw what he is getting the Peace Prize for combating: sexual violence used as a weapon in war. He put the war into a wider political context when he criticized the central government in Kinshasa for betraying the country’s people. That put him out of favour with the government. When the government had to congratulate Mukwege on the prize announcement on 5 October, Lambert Mendé, the communications minister, said that Mukwege “could be politically manipulated”. It is not the government that has saved him from assassination attempts. The current president, Joseph Kabila, came to power in 2001 and has exceeded his most recent electoral mandate by two years. Mukwege has said that he wants a “transition without Kabila”. Now Kabila is set to resign. New elections were held in December, and despite stringent controls, the danger of rigging persisted: Kabila’s right-hand man, Felix Tshisekedi, was elected. Questions have been raised about those results. Mukwege did not publically support any candidate, although many have put their names forward. The opposition did not succeed in uniting to support any particular candidate. This is because leaders in several of the country’s provinces are using ethnic conflicts to secure power, and because foreign interests are dragging “their” local allies in different directions. Joseph Kabila took over following the murder of his father, Laurent Kabila. While Laurent came to power in 1997 with the assistance of neighbouring countries, particularly Rwanda, which was mainly responsible for Mobutu’s military overthrow, his son Joseph came to prominence gradually. After Laurent changed sides, dropped Rwanda, and thereby challenged its powerful president Paul Kageme, Zimbabwe’s long-serving President Mugabe threw his support behind Laurent. After Laurent’s murder, Joseph took over as Mugabe’s protégé. Without this support, which is being continued by Mugabe’s successor, the Kabila clan would not have remained in power so long. As payment, political and military leaders in Zimbabwe have been given access to products from southern DRC’s gold and diamond mines. The DRC illustrates how being rich in natural resources can be a curse. “Everyone” is exploiting a bad security situation to seize resources – without any consideration for a poor and oppressed local population. They were not the only recipients of such products. Where there are rich mineral deposits, there is also often war. In 2018, armed conflicts have taken place in several of the country’s 20 provinces. In the south and west there are gold, diamonds and oil, in the north and east there are cobalt and a number of other minerals vital to the electronics and car industries. 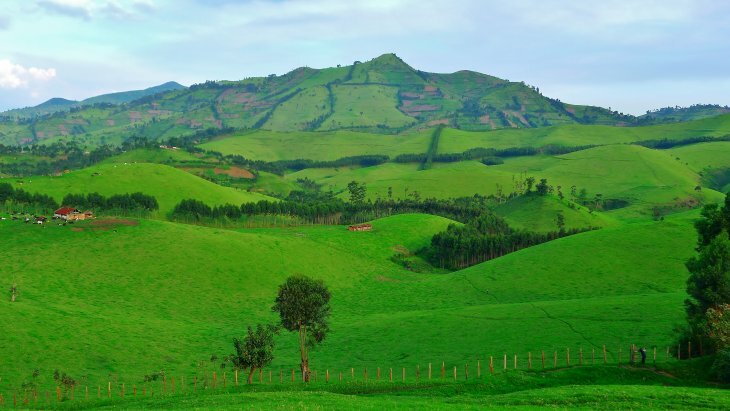 The mineral-rich Kivu provinces in the east were invaded by Hutu fighters, who had fled from Rwanda after having killed hundreds of thousands of Tutsis in 1994. In the following years, government forces from Rwanda entered the DRC to hunt down the Hutu fighters. Many evaded capture and have continued to terrorize the Congolese. In addition, Rwanda and Uganda have gone to war over the control of northern DRC, while at the same time they have a shared interest in weakening the central government in Kinshasa. The road from ally to enemy is short in the DRC. It is in this difficult terrain that French and Moland served as mercenaries. Norwegian Church Aid and Doctors Without Borders have completely different roles. Today, many guerrilla-like groups extract minerals in eastern DRC and sell them on international black markets. The income allows them to keep areas under their control and terrorize the population. The DRC illustrates how being rich in natural resources can be a curse. “Everyone” is exploiting a bad security situation to seize resources – without any consideration for a poor and oppressed local population. In the east the exploiters are the guerrillas, in the south they are foreigners and the national elite. The DRC has great possibilities. Its rivers could become transport arteries and be used to generate electricity. Its forests are of global importance for climate policy. The effective application of the US “conflict minerals” provision, which renders illegal the sale of minerals from mines in Kivu province, could eliminate the guerrillas. The UN forces that are there now could do a better job. Foreign powers, including China, which is now on its way in, could resist the temptation to exploit the DRC economically and politically. Foreign companies could pay more tax. South Africa, a new regime in Angola and some Western powers have pressured Kabila to resign. The Congolese are accustomed to being oppressed, first by the Belgian colonial authorities, and later by global and regional powers – and the country’s own elite. According to Braeckman they live in the present, scarred by their history, without any particular faith in themselves or the future. Mukwege is helping to change this. In parallel with the political difficulties and conflicts, much is happening that is positive. Congolese researchers and their American counterparts have come a long way in developing a treatment for Ebola, which has broken out several times in DRC. A large number of small businesses have emerged. Congolese music is conquering the world. Many of the 80 million citizens of DRC live in the digital age. In brief: this is a reality that our media scarcely ever show and that our politicians and diplomats don’t seem to bother much about. *A former Norwegian military soldier who was caught, together with his companion Tjostolv Moland in North Congo in 2008 and sentenced for espionage and for having murdered a Congolese driver whom they hired on a clandestine mission in the conflict areas. This article was originally published in Norwegian in Aftenposten on 9 December 2018.